All along Norway's 1,110-mile length, fingers of ocean wind inland between steep mountains. Three-fourths of the land is rocky slope, bleak plateau, lake or glacial ice. Forests cloak nearly a fourth in conifers and birch; scarcely four per cent is flat and fertile. Thus with its face to the sea, its rugged interior hostile to the plow, the fjord country in Norway saw the flowering of the Viking Era. 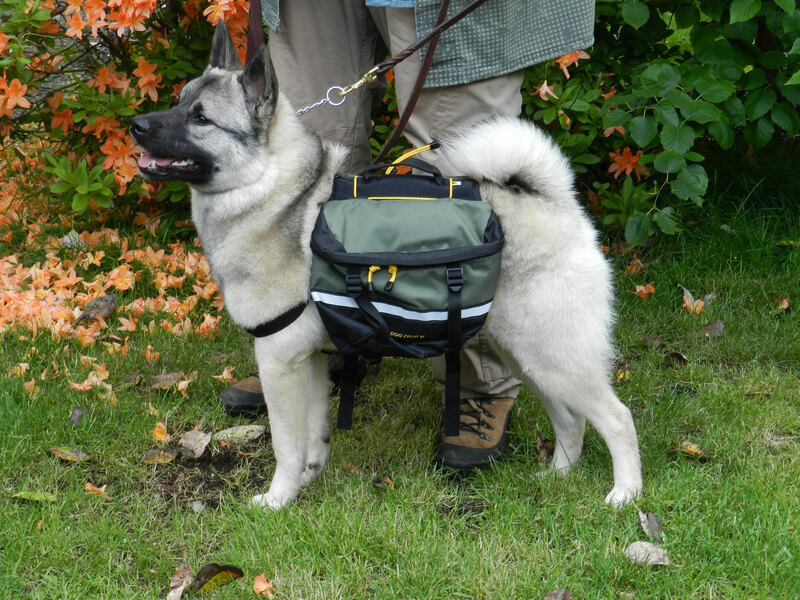 As rugged as the land from which he sprang, the Norwegian Elkhound was a cherished possession of his Viking masters, and he appears in many of the old sagas. 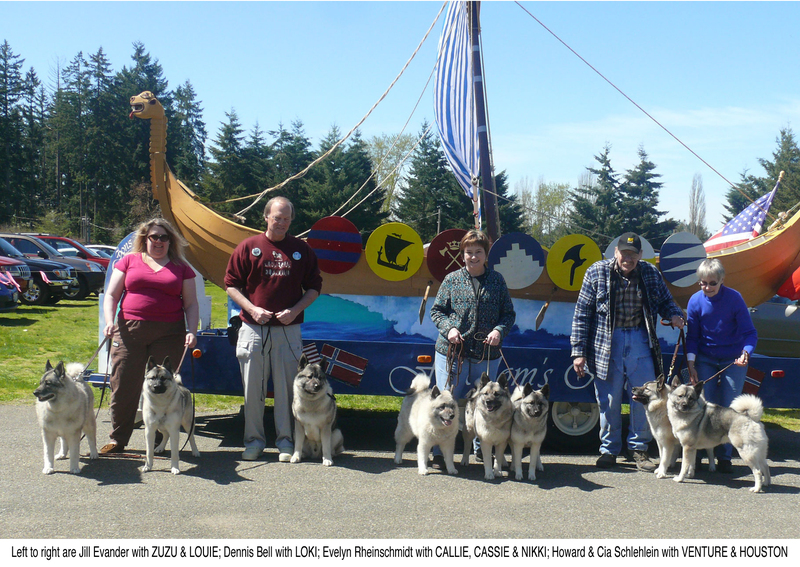 Although he is known as the "Dog of the Vikings," the Elkhounds earliest association with man dates from much earlier. In the famous Viste Cave at Jaeren in western Norway, archeological investigations brought to light a number of stone implements and bones dating from 5000 to 4000 BC. Included among these remains of an even earlier civilization were four skeletons of dogs, two of which were identified by Professor Brinchmann of the Bergen Museum as of definite Elkhound type. 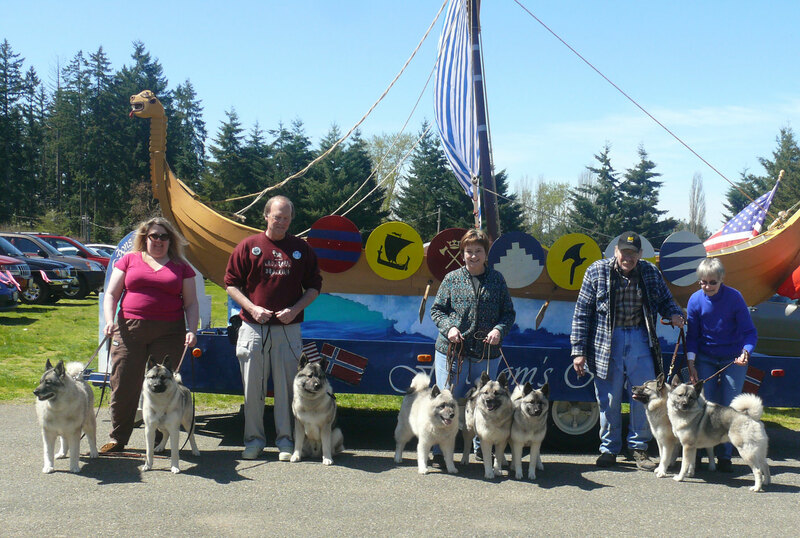 Thus even before the Viking Era, with primitive man the Elkhound had begun that long and staunch companionship with mankind. What his earliest duties were we can only surmise, but it is safe to say they involved the chase and the guardianship of his master's crude belongings and primitive hearth. From the present back through the centuries of recorded time, Elkhounds have been kept in Norwegian rural districts by farmers, herdsmen, and hunters to serve as watchdogs, guardians of flocks, and as trackers of big game: moose, reindeer, and bear. Outdoor jobs, all of them, in a rugged country and in a rigorous sub-arctic climate. The height at the withers for males is 20½ inches, for females 19½ inches. Weight for males is about 55 pounds, for females it’s about 48 pounds. 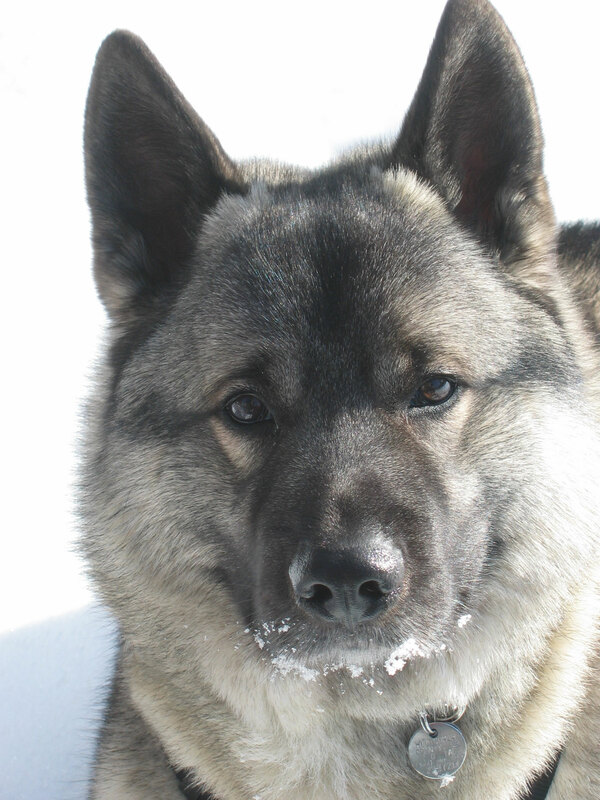 Elkhounds are square in profile and close coupled. The distance from the brisket to the ground appears to be half the height at the withers. The distance from fore-chest to the rump equals the height at the withers. Their bone structure is substantial, without being coarse. The head is broad at the ears, wedge shaped, strong and dry (without loose skin). The expression is keen and alert, indicating a dog with great courage. The eyes are a very dark brown, medium in size, oval, not protruding. The ears are set high, firm and erect, yet very mobile. The ears are comparatively small; slightly taller than their width at the base with pointed (not rounded) tips. When the dog is alert, the orifices turn forward and the outer edges are vertical. When the dog is relaxed or showing affection, the ears go back. Viewed from the side, the forehead and back of the skull are only slightly arched; the stop is not large, yet clearly defined. The muzzle is thickest at the base and, seen from above or from the side, tapers evenly without being pointed. The bridge of the nose is straight, parallel to and about the same length as the skull. Lips are tightly closed and teeth meet in a scissors bite. The neck of medium length, muscular, well set up with a slight arch and with no loose skin on the throat. The back is straight and strong from its high point at the withers to the root of the tail. The body is short and close-coupled with the rib cage accounting for most of its length. Chest deep and moderately broad; brisket level with points of elbows; and ribs well sprung. Loin short and wide with very little tuck-up. 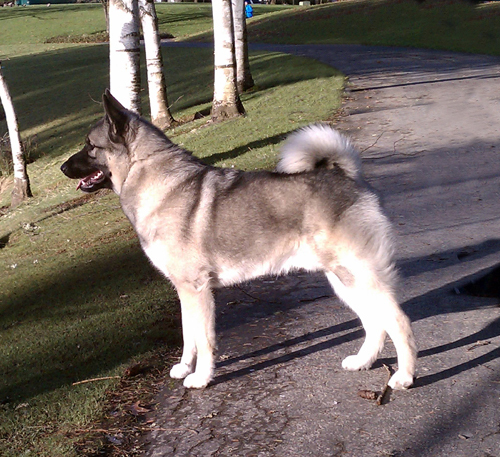 Tail set high, tightly curled, and carried over the centerline of the back. It is thickly and closely haired, without brush, natural and untrimmed. Moderate angulation at stifle and hock. Thighs are broad and well muscled. Seen from behind, legs are straight, strong and without dewclaws. The coat is thick, hard, weather resisting and smooth lying; made up of soft, dense, woolly undercoat and coarse, straight covering hairs. Short and even on head, ears, and front of legs; longest on back of neck, buttocks and underside of tail. 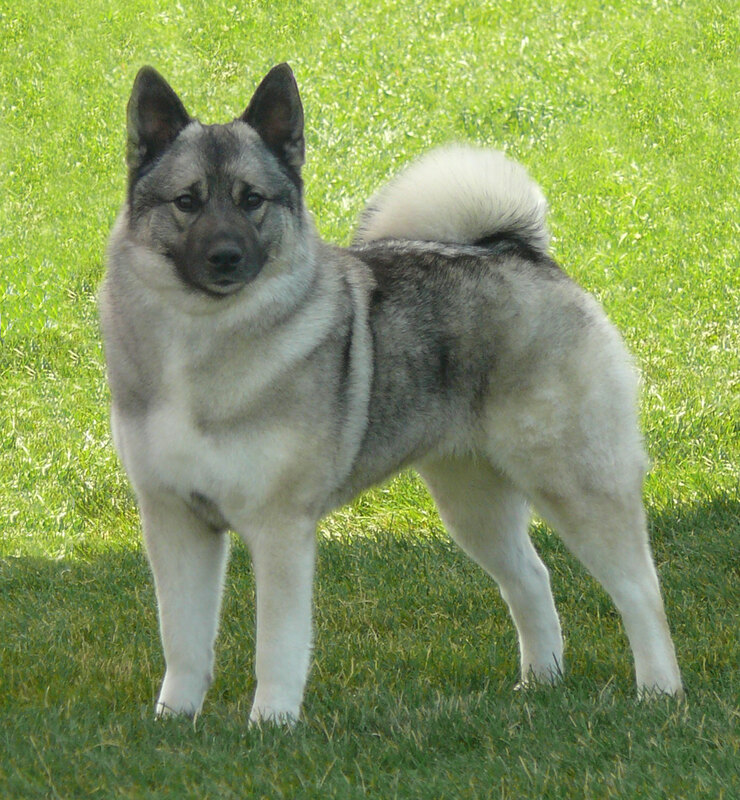 Norwegian Elkhounds are gray, medium preferred, variations in shade determined by the length of black tips and quantity of guard hairs. Undercoat is clear light silver as are legs, stomach, buttocks, and underside of tail. The gray body color is darkest on the saddle, lighter on the chest, mane and distinctive harness mark (a band of longer guard hairs from shoulder to elbow). The muzzle, ears and tail tip are black. The black of the muzzle shades to lighter gray over the forehead and skull. Yellow or brown shading, white patches, indistinct or irregular markings, "sooty" coloring on the lower legs and light circles around the eyes are undesirable. The gait is normal for an active dog constructed for agility and endurance. At a trot the stride is even and effortless; the back remains level. As the speed of the trot increases, front and rear legs converge equally in straight lines toward a center line beneath the body, so that the pads appear to follow in the same tracks (single track). Front and rear quarters are well balanced in angulation and muscular development. 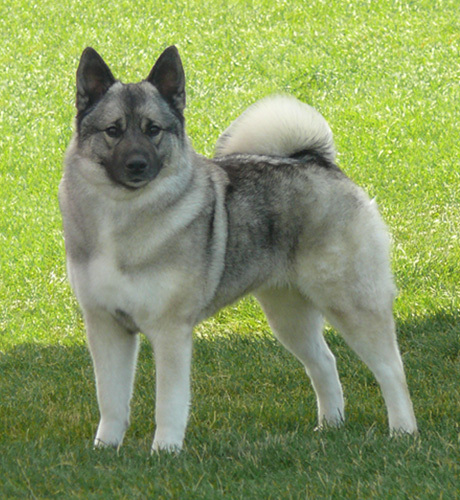 The temperament of the Norwegian Elkhound is bold and energetic, an effective guardian yet normally friendly, with great dignity and independence of character.